The first time I baked bread from scratch was 10 years ago when I spent an entire weekend cooking and baking. I’d armed myself with the ingredients for a simple loaf of whole-wheat bread and went for it. I was rewarded with an apartment filled with the warm aroma of homemade bread. I was really excited when award-winning cookbook author Nancy Baggett shared 5 of her easy, amazing recipes for no-knead breads. I love dunking chunks of Crunchy-Munchy Corn & Millet Bread—a rustic round loaf that’s crunchy on the outside and moist and soft on the inside—into creamy chowder. And chewy-crisp and fragrant Parmesan-Herb Focaccia goes well with any Italian food. Try Nancy’s 6 tips for great no-knead breads and you’ll be baking homemade bread in no time. 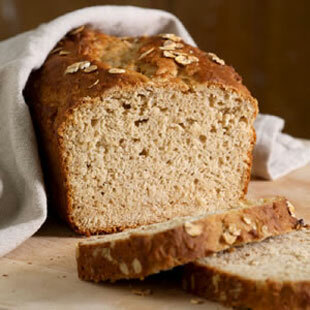 Try this Honey Oat Quick Bread. It has a yummy flavor and is divinely moist and tender. It requires minimal mixing and cleanup, calls for ingredients usually stocked in the pantry, and is tasty yet healthful. Bonus: it takes just 15 minutes to prep!